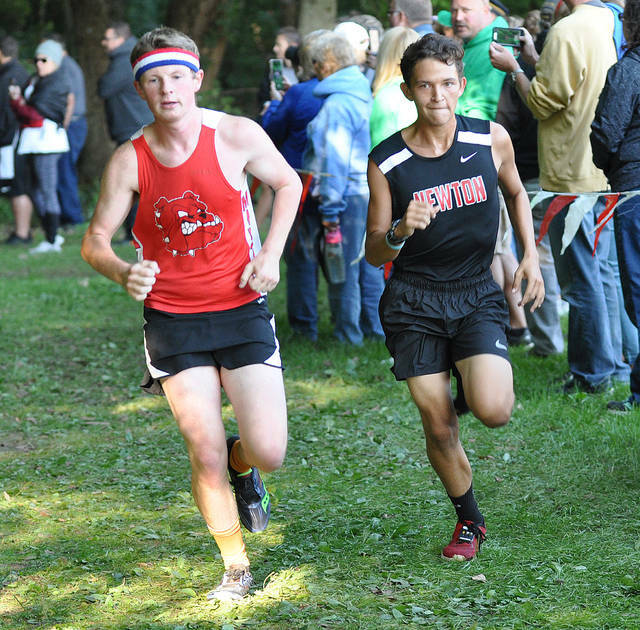 Rob Kiser|Call Photo Newton’s Ben Hoover and Troy’s Braden Coate come out of the woods at the Miami County Invitational Saturday. 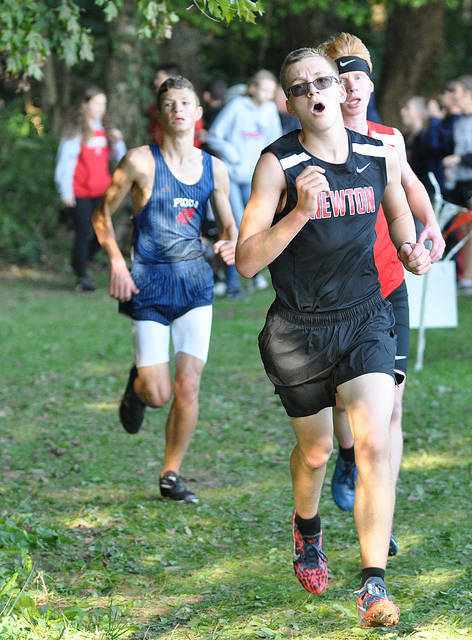 WEST MILTON — Ben Hoover led Newton to a third-place finish at the Miami County Invitational Saturday. Hoover finished second in 16:43.9. 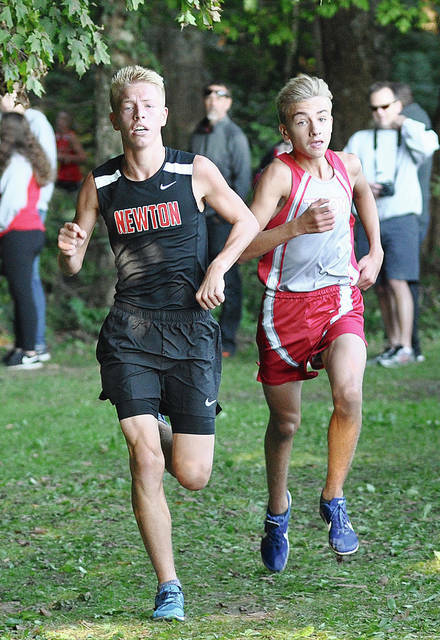 The rest of Newton’s top seven were Owen Via, 32, 18:30.3; Curtis Shellenberger, 35, 18:33.5; Jacob Moore, 51, 19:02.1; Robert Ingle, 62, 19:30.1; Clint Shellenberger, 83, 20:11.9; and Colton Flanary, 126, 22:16.1. 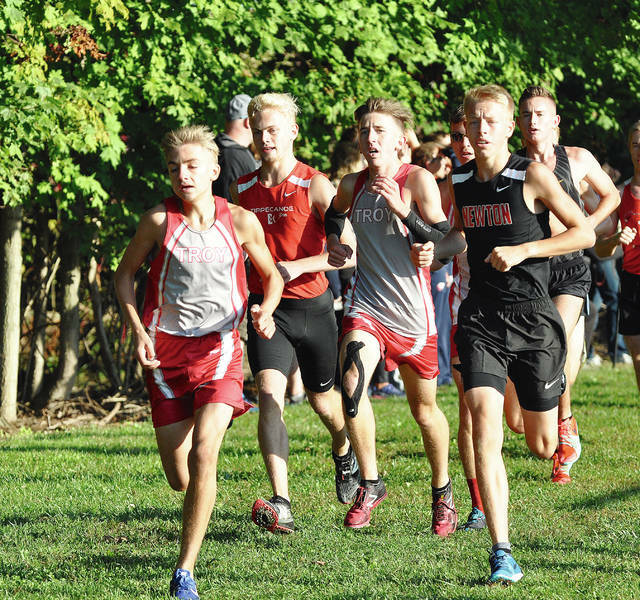 The Indians top seven included Nolan Campbell, 14, 17:31.2; Mitch Fletcher, 15, 17:45.3; Gaven Barnes, 44, 18:50.2; Paul Hinds, 47, 18:52.7; Roy Moreaux, 71, 19:46.5; Cael Barr, 80, 20:04.7; and Jesse Furman, 84, 20:19.0. 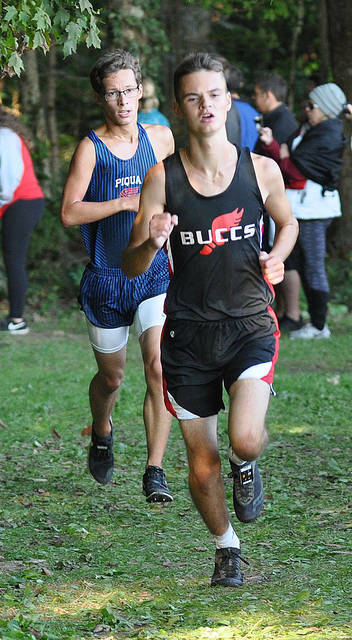 The Buccs top seven included Bennett Wellborn, 18, 17:44.4; Owen Boehringer, 56, 19:12.5; Fletcher Metz, 60, 19:20.1; Ian Benedict, 19:23.2; Owen Rawson, 69, 19:42.2; Zane Barhorst, 75, 19:50.5; and Tyler Alexander, 82, 20:11.5. The Vikings top seven included Alex Hayes, 23, 17:59.6; Cam Richter, 26, 18:06.4; Michael Bair, 72, 19:47.2;Garrett LeMaster, 73, 19:49.3; Adam Bensman, 88, 20:34.6; Cameron DeWeese, 94, 20:41.9; Christian DeWeese, 95, 20:44.2. The Railroaders top seven included Jackson Moore,53, 19:08.1; Jay Roberts, 76, 19:50.8; Aiden Beachler, 100, 20:51.6; Shane Bryan, 128, 22:31.4; Jared Shellabarger, 132, 23:01.9; Hunter Biddlestone, 137, 24:28.0; and Andrew Moyer, 145, 33:31.4. At the Best of the West Invitational in Botkins, Tristin Freistuhler led Houston to a second-place finish behind Columbus Grove. Freistuhler was second in 17:03.0. The rest of Houston’s top seven were Ethan Knouff, 7, 17:19.8; Blake Jacobs, 14, 17:34.9; Patrick Meiring, 39, 18:39.6; Ryan Ely, 47, 19:02.5; Joseph Earl, 63, 19:24.2; and Jacob Slater, 82, 19:46.1. The Tigers top seven included Don Juan, 16, 17:37.4; Stuart Baltes, 25, 18:09.4; Noah Barga, 44, 18:55.4; Brooks Blakeley, 45, 18:56.9; Alex Brewer, 50, 19:08.1; Jarrett Petijean, 58, 19:20.9; and Matt Cromwell, 62, 19:24.1. The Cavaliers top six were Elias Bezy, 84, 19:46.7; Alex Vanderhorst, 103, 20:15.9; Scott Petersen, 174, 22:31.6; Andrew Wiseman, 193, 24:24.5; Aaron Topp, 196, 24:36.8; and Casey Topp, 211, 28:28.7.
https://www.dailycall.com/wp-content/uploads/sites/30/2018/09/web1_benhoover.jpgRob Kiser|Call Photo Newton’s Ben Hoover and Troy’s Braden Coate come out of the woods at the Miami County Invitational Saturday.